Carbonated water or soda water is water containing dissolved carbon dioxide gas, either artificially injected under pressure or occurring due to natural geological processes. Carbonation causes small bubbles to form, giving the water an effervescent quality. Common forms include sparkling natural mineral water, club soda, and commercially produced sparkling water (also known as 'seltzer water' in the U.S.). Club soda, sparkling mineral water, seltzer and many other sparkling waters contain added or dissolved minerals such as potassium bicarbonate, sodium bicarbonate, sodium citrate, or potassium sulfate. These occur naturally in some mineral waters but are also commonly added artificially to man-made waters to mimic a natural flavor profile. Various carbonated waters are sold in bottles and cans, with some also produced on demand by commercial carbonation systems in bars and restaurants, or made at home using a carbon dioxide cartridge. It is thought the first person to aerate water with carbon dioxide was William Brownrigg in 1740, although he never published a paper. Carbonated water was independently accidentally invented by Joseph Priestley in 1767 when he discovered a method of infusing water with carbon dioxide after suspending a bowl of water above a beer vat at a brewery in Leeds, England. He wrote of the "peculiar satisfaction" he found in drinking it, and in 1772 he published a paper entitled Impregnating Water with Fixed Air. Priestley’s apparatus, which featured a bladder between the generator and the absorption tank to regulate the flow of carbon dioxide, was soon joined by a wide range of others, but it wasn’t until 1781 that carbonated water began being produced on a large scale with the establishment of companies specialized in producing artificial mineral water. The first factory was built by Thomas Henry of Manchester, England. Henry replaced the bladder in Priestley’s system with large bellows. While Priestley is regarded as “the father of the soft drink,” he did not benefit financially from his invention. He did however receive scientific recognition when the Council of the Royal Society “were moved to reward its discoverer with the Copley Medal” in 1772. Natural and man-made carbonated waters may contain a small amount of sodium chloride, sodium citrate, sodium bicarbonate, potassium bicarbonate, potassium citrate, potassium sulfate, or disodium phosphate, depending on the product. These occur naturally in mineral waters but are added artificially to commercially produced waters to mimic a natural flavor profile. Artesian wells in such places as Mihalkovo in the Bulgarian Rhodope Mountains, Medžitlija in North Macedonia, and most notably in Selters in the German Taunus mountains, produce naturally effervescent mineral waters. By itself, carbonated water appears to have little impact on health. While carbonated water is somewhat acidic, this acidity can be partially neutralized by saliva. A study found that sparkling mineral water is slightly more erosive to teeth than non-carbonated water but is about 100 times less erosive to teeth than are soft drinks. Carbonated water may increase irritable bowel syndrome symptoms of bloating and gas due to the release of carbon dioxide in the digestive tract. It does not appear to have an effect on gastroesophageal reflux disease. There is tentative evidence that carbonated water may help with constipation among people who have had a stroke. Carbonated water such as club soda or sparkling water is defined in US law as a food of minimal nutritional value, even if minerals, vitamins, or artificial sweeteners have been added to it. Bonds between gaseous carbon dioxide and liquid water are more easily broken at high temperatures. Thus sparkling water at lower temperatures (far right) hold more carbonation than at high (far left). The acid gives carbonated water a slightly tart flavor. The pH level between 3 and 4 is approximately in between apple juice and orange juice in acidity, but much less acidic than the acid in the stomach. A normal, healthy human body maintains pH equilibrium via acid–base homeostasis and will not be materially adversely affected by consumption of plain carbonated water. Alkaline salts, such as sodium bicarbonate, potassium bicarbonate, or potassium citrate, will increase pH. The amount of a gas that can be dissolved in water is described by Henry's Law. In the carbonization process water is chilled, optimally to just above freezing, to maximize the amount of carbon dioxide that can be dissolved in it. Higher gas pressure and lower temperature cause more gas to dissolve in the liquid. When the temperature is raised or the pressure is reduced (as happens when a container of carbonated water is opened), carbon dioxide effervesces, thereby escaping from the solution. Many alcoholic drinks, such as beer, wine and champagne, were naturally carbonated through the fermentation process for centuries. In 1662 Christopher Merret was creating 'sparkling wine'. William Brownrigg was apparently the first to produce artificial carbonated water, in the early 1740s, by using carbon dioxide taken from mines. In 1750 the Frenchman Gabriel François Venel also produced artificial carbonated water, though he misunderstood the nature of the gas that caused the carbonation. In 1764, Irish chemist Dr. Macbride infused water with carbon dioxide as part of a series of experiments on fermentation and putrefaction. 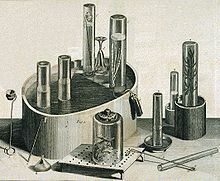 In 1766 Henry Cavendish devised an aerating apparatus that would inspire Joseph Priestley to carry out his own experiments with regards to carbonated waters. Cavendish was also aware of Brownrigg's observations at this time and published a paper on his own experiments on a nearby source of mineral water at the beginning of January in the next year. In 1767, Joseph Priestley discovered a method of infusing water with carbon dioxide when he suspended a bowl of water above a beer vat at a local brewery in Leeds, England. The air blanketing the fermenting beer—called 'fixed air'—was known to kill mice suspended in it. Priestley found water thus treated had a pleasant taste, and he offered it to friends as a cool, refreshing drink. At that time, as even now, sodium bicarbonate was used in medicines and for making baking powder. Known as 'soda bicarb', it was produced by bubbling carbon-dioxide through a solution of sodium carbonate obtained from the ashes of plants. In 1772, Priestley published a paper titled Impregnating Water with Fixed Air in which he describes dripping "oil of vitriol" (sulfuric acid) onto chalk to produce carbon dioxide gas, and encouraging the gas to dissolve into an agitated bowl of water. Priestley referred to his invention of soda water as being his "happiest" discovery. Priestley’s apparatus, which featured a bladder between the generator and the absorption tank to regulate the flow of carbon dioxide, was soon joined by a wide range of others, but it wasn’t until 1781 that carbonated water began being produced on a large scale with the establishment of companies specialized in producing artificial mineral water. The first factory was built by Thomas Henry of Manchester, England. Henry replaced the bladder in Priestley’s system with large bellows. J. J. Schweppe developed a process to manufacture bottled carbonated mineral water based on the discovery of Priestley, founding the Schweppes Company in Geneva in 1783. Schweppes regards Priestley as “the father of our industry”. In 1792 he moved to London to develop the business there. In 1799 Augustine Thwaites founded Thwaites' Soda Water in Dublin. A London Globe article claims that this company was the first to patent and sell "Soda Water" under that name. The name soda water arose from the observation by Richard Bewley, an 18th-century English chemist from Norfolk, that the addition of a little sodium carbonate to the water greatly facilitated the absorption of carbon dioxide. Modern carbonated water is made by injecting pressurized carbon dioxide into water. The pressure increases the solubility and allows more carbon dioxide to dissolve than would be possible under standard atmospheric pressure. When the bottle is opened, the pressure is released, allowing gas to exit the solution, forming the characteristic bubbles. In the United States, carbonated water was known as soda water until World War II, due to the sodium salts it contained. These were added as flavoring and acidity regulators with the intent of mimicking the taste of natural mineral water. During the Great Depression, it was sometimes called "two cents plain", a reference to its being the cheapest drink at soda fountains (i.e. without the addition of three cents' worth of flavored syrup). In the 1950s, terms such as sparkling water and seltzer water gained favor. The term seltzer water is a genericized trademark that derives from the German town Selters, which is renowned for its mineral springs. Naturally carbonated water, Selters, has been commercially bottled and shipped from this town since the 18th century or earlier. Generally, seltzer water has no added sodium salts, while club soda still retains some of the sodium salts that once were used. The term "Seltzer water" is virtually unknown in Britain and most Commonwealth countries, although Australians of a certain age remember Selza Saline powder in metal tins with lids which had to be opened for each use with the back of a spoon, sold during the 1950s. In the United Kingdom and Canada today, drink mixers sold as soda water or club soda contain bicarbonate of soda, which gives them a specific flavor and differentiates them from carbonated water. It is popularly used for mixed drinks such as whisky and soda and Campari soda. The arrival of carbonated water onto the cocktail scene changed the way people drank. Instead of drinking liquor straight or neat (without a mixer), soda water and carbonated soft drinks helped dilute alcohol, and made having a drink more socially acceptable. Whisky and sodas can be seen in many British TV series and films from the 1960s and earlier and the soda siphon is ubiquitous in many movies made before 1970. Only a small amount of soda water is added; a 'splash', and 'Scotch and a splash' was a common bar order. Whisky and soda was commonly drunk without ice in the UK. Social drinking changed with the counter-culture movement of the 1970s and the arrival of new bottled and canned beverages in the 1980s, and soda water has declined in popularity. Soda siphons are still bought by the more traditional bar trade and are available at the bar in many upmarket establishments, but in the UK there are now only two wholesalers of soda-water in traditional glass siphons, and an estimated market of around 120,000 siphons per year (2009). Worldwide, preferences are for beverages in recyclable plastic containers. Home soda siphons and soda water are enjoying a renaissance in the 21st century as retro items become fashionable. Contemporary soda siphons are commonly made of aluminum, although glass and stainless steel siphons are available. The valve-heads of today are made of plastic, with metal valves, and replaceable o-ring seals. Older siphons are in demand on on-line auction sites. Carbonated water, without the acidity regulating addition of soda, is currently seen as fashionable although home production (see above) is mainly eschewed in favor of commercial products. The soda siphon, or seltzer bottle—a glass or metal pressure vessel with a release valve and spout for dispensing pressurized soda water—was a common sight in bars and in early- to mid-20th-century homes where it became a symbol of middle-class affluence. The gas pressure in a siphon drives soda water up through a tube inside the siphon when a valve lever at the top is depressed. Commercial soda siphons came pre-charged with water and gas, and were returned to the retailer for exchange when empty. A deposit scheme ensured they were not otherwise thrown away. 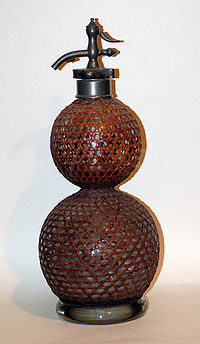 Home soda siphons can carbonate flat water through the use of a small disposable steel bulb containing carbon dioxide. The bulb is pressed into the valve assembly at the top of the siphon, the gas injected, then the bulb withdrawn. Soda water made in this way tends not to be as carbonated as commercial soda water because water from the refrigerator is not chilled as much as possible, and the pressure of carbon dioxide is limited to that available from the cartridge rather than the high-pressure pumps in a commercial carbonation plant. The gasogene (or gazogene, or seltzogene) is a late Victorian device for producing carbonated water. It consists of two linked glass globes: the lower contained water or other drink to be made sparkling, the upper a mixture of tartaric acid and sodium bicarbonate that reacts to produce carbon dioxide. The produced gas pushes the liquid in the lower container up a tube and out of the device. The globes are surrounded by a wicker or wire protective mesh, as they have a tendency to explode. The Codd-neck bottle's special shape is designed to contain a marble which seals in the carbonation. In 1872, British soft drink maker Hiram Codd of Camberwell, London, designed and patented the Codd-neck bottle, designed specifically for carbonated drinks. The Codd-neck bottle encloses a marble and a rubber washer/gasket in the neck. The bottles were filled upside down, and pressure of the gas in the bottle forced the marble against the washer, sealing in the carbonation. The bottle was pinched into a special shape to provide a chamber into which the marble was pushed to open the bottle. This prevented the marble from blocking the neck as the drink was poured. The bottles were regularly produced for many decades, but gradually declined in usage. Since children smashed the bottles to retrieve the marbles, they are relatively rare and have become collector items, particularly in the UK. They could be found at retail shops and restaurants in many parts of the world until recently.[when?] Due to the risk of explosion and injuries from fragmented glass pieces, use of this type of bottle is no longer encouraged in most countries. The Codd-neck design is still used for the Japanese soft drink Ramune and in the Indian drink called Banta. A typical all-in-one soda maker for home use found in supermarkets. A refillable carbon dioxide canister and a high pressure bottle are often included. Soda makers or soda carbonators are appliances that carbonate water with multiple-use carbon dioxide canisters. Soda makers may reach a higher level of carbonation than home soda siphons. A variety of systems are produced by manufacturers and hobbyists. The commercial units may be sold with concentrated syrup for making flavored soft drinks. One major producer of soda carbonators is SodaStream. Their products were popular during the 1970s and 1980s in the United Kingdom, and are associated with nostalgia for that period and have experienced a comeback in the 2000s. The process of dissolving carbon dioxide in water is called carbonation. Commercial soda water in siphons is made by chilling filtered plain water to 8 °C (46 °F) or below, optionally adding a sodium or potassium based alkaline compound such as sodium bicarbonate to reduce acidity, and then pressurizing the water with carbon dioxide. The gas dissolves in the water, and a top-off fill of carbon dioxide is added to pressurize the siphon to approximately 120 pounds per square inch (830 kPa), some 30 to 40 psi (210–280 kPa) higher than is present in fermenting champagne bottles. 2 from pressurized tanks at approximately 100 psi (690 kPa). The pressurized, carbonated water then flows to taps or to mixing heads where it is then mixed with flavorings as it is dispensed. Plain carbonated water is often consumed as an alternative to soft drinks. However, a soft drink is a beverage that typically contains carbonated water, a sweetener and a flavoring. Flavored carbonated water is also commercially available like cola. Carbonated water is often consumed mixed with fruit juice. It differs from sodas in that it contains flavors (usually sour fruit flavors such as lemon, lime, cherry, orange, or raspberry) and usually a sweetener. Many people cut up fresh fruit and put in their carbonated water. Carbonated water is a diluent mixed with alcoholic beverages where it is used to top-off the drink and provide a degree of 'fizz'. Adding soda water to 'short' drinks such as spirits dilutes them and makes them 'long' not to be confused with long drinks such as those made with vermouth. Carbonated water also works well in short drinks made with whiskey, brandy, and Campari. Soda water may be used to dilute drinks based on cordials such as orange squash. Soda water is a necessary ingredient in many cocktails, such as whisky and soda or Campari and soda. Carbonated water is increasingly popular in cooking to provide a lighter texture to doughs and batters as compared to regular water. Kevin Ryan, a food scientist at the University of Illinois at Urbana–Champaign, says the effervescent bubbles when mixed with dough provide a light texture, as in tempura. Pockets of carbon dioxide gas are introduced into the dough and further expand when cooking. The popular belief that carbonated water is a good remover of clothing stains, particularly those of red wine, is based on hearsay and anecdotal evidence. The dissolved gas in water acts as a temporary surfactant. There is no underlying chemical reason why carbonated water would be superior to plain water in stain removal. ^ Homan, Peter Gerald (22 September 2007). "Aerial Acid: A short history of artificial mineral waters" (PDF). ^ a b c d e f g h Schils, René (2011). How James Watt Invented the Copier: Forgotten Inventions of Our Great Scientists. Springer Science & Business Media. p. 36. ^ "Our fizzy seas of soda water". The Telegraph. 21 September 2016. ^ McKie, Douglas (18 July 2013). "Joseph Priestley and The Copley Medal". Ambix. 9: 1–22. doi:10.1179/amb.1961.9.1.1. ^ "Powerful Effervescence". Summer 2008. Retrieved 2019-02-13. ^ Manual of Dietetic Practice (5 ed.). John Wiley & Sons. 2014. p. 998. ISBN 9781118760574. Retrieved 19 June 2016. ^ Cite error: The named reference CNN2011 was invoked but never defined (see the help page). ^ Parry J, Shaw L, Arnaud MJ, Smith AJ (August 2001). "Investigation of mineral waters and soft drinks in relation to dental erosion". J Oral Rehabil. 28 (8): 766–72. doi:10.1046/j.1365-2842.2001.00795.x. PMID 11556958. ^ a b "Can I drink carbonated water? - CNN.com". Retrieved 15 March 2016. ^ Johnson, T; Gerson, L; Hershcovici, T; Stave, C; Fass, R (March 2010). "Systematic review: the effects of carbonated beverages on gastro-oesophageal reflux disease". Alimentary Pharmacology & Therapeutics. 31 (6): 607–14. doi:10.1111/j.1365-2036.2010.04232.x. PMID 20055784. ^ Coggrave, M; Norton, C; Cody, JD (13 January 2014). "Management of faecal incontinence and constipation in adults with central neurological diseases". The Cochrane Database of Systematic Reviews (1): CD002115. doi:10.1002/14651858.CD002115.pub5. PMID 24420006. ^ "Foods of Minimal Nutritional Value". fns.usda.gov. Appendix B of 7 CFR Part 210. Food and Nutrition Service, United States Department of Agriculture. 13 September 2013. Retrieved 2017-08-04. ^ Field, Simon Quellen (2012). Culinary Reactions. Chicago, IL: Chicago Review Press. pp. 99–100. ISBN 978-1-56976-706-1. ^ "Carbon Dioxide in Water Equilibrium, Page 1". Retrieved 2010-07-23. ^ James Monroe Jay; Martin J. Loessner; David Allen Golden (2005). Modern food microbiology. シュプリンガー・ジャパン株式会社. p. 210. ISBN 978-0-387-23180-8. ^ "The "Subtile Aereal Spirit of Fountains": Mineral Waters and the History of Pneumatic Chemistry » Brill Online". Early Science and Medicine. 21 (4): 303–331. 2016-11-15. doi:10.1163/15733823-00214p02. PMID 29944255. ^ Funderburg, Anne Cooper (1995). Chocolate, Strawberry, and Vanilla. ISBN 9780879726928. Retrieved 15 March 2016. ^ Funderburg, Anne Cooper (2002). "Experimental+Essays+on+Fermentation+of"#v=onepage&q=Macbride%20%22Experimental%20Essays%20on%20Fermentation%20of%22&f=false Sundae Best: A History of Soda Fountains. ISBN 9780879728540. ^ "The London Medical and Physical Journal - Google Books". 1801. Retrieved 2018-01-03. ^ Homan, Peter Gerald. "AERIAL ACID: a short history of artificial mineral waters" (PDF). idus.us.es. Retrieved May 8, 2017. ^ "XI. Experiments on Rathbone-place water". Rstl.royalsocietypublishing.org. Retrieved 2018-01-03. 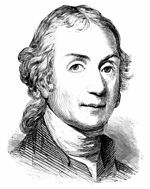 ^ "Joseph Priestley — Discovery of Oxygen — Invention of Soda Water by Joseph Priestley". Inventors.about.com. 2009-09-16. Retrieved 2009-09-23. ^ "Invention of Soda Water". St. John Daily Sun. London Globe. 4 January 1904. Retrieved 2 September 2013. ^ Hargreaves, Anne (1993). Medicine in Northumbria: Essays on the History of Medicine in the North East of England. Pybus Society. p. 269. ^ "Definition of seltzer — Merriam-Webster Online Dictionary". Retrieved 2007-11-07. ^ "Lemon Saline Powder - Remember That?". Retrieved 2013-08-04. ^ Phrase Finder is copyright Gary Martin, 1996-2016. All rights reserved. "A load of codswallop". Retrieved 15 March 2016. ^ "Making Carbonated Mineral Water". Milwaukee Makerspace. 2011-09-26. ^ "Home Carbonation System". Instructibles. 2007-07-15. ^ "Sodastream". Waitrose Food Illustrated. Waitrose. 12 September 2006. Archived from the original on 12 September 2006. Retrieved 12 September 2006. ^ David Smith (18 June 2006). "Wham! Big hair and Eighties pop make internet comeback". The Observer. Retrieved 12 September 2006. ^ Rentschler, Kay. "Sparkling water lightens foods". Chicago Tribune. Chicago Tribune. Retrieved 27 December 2014. ^ Wishnok, Pete. "How does club soda remove red wine stains?". Scientific American. Retrieved 15 April 2016. Wikimedia Commons has media related to Carbonated water. Wikisource has the text of the 1911 Encyclopædia Britannica article Aerated waters.